Andrea Zucker Muzin, granddaughter of Rose and Carl, wrote the following for the annual Holocaust supplement of Charleston's Post and Courier in April 2009. It is reprinted here with permisson. A few months ago, I was looking through old family photographs. There was one of my grandmother and grandfather in Germany after the war; one of my grandfather standing in front of a displaced persons camp in Eschwege, outside of Berlin, pushing a pram holding my Aunt Eva; and one of my mother, around age one, in Jacksonville, Florida. Then I found a picture of my grandfather holding an unfamiliar little girl. Who was she? My mother reminded me. My grandfather, Carl "Kisel" Goldberg, was married and had a three-year-old daughter before the war. My grandmother, Rose "Roza" Mibab Goldberg, was around fourteen, twelve years younger, and often played with his little girl since their family businesses, a clothing store and hat store, were next door to one another. In 1939, when the Germans invaded my grandmother's Polish town, called Wladimir-Wolinsk by some or Ludmir by others, my grandfather's home was bombed while he was out working. His wife and daughter were killed--buried under the building's remains. He searched through the rubble for days until he found them to give them a proper burial. In the fall of 1941, the Jews of Ludmir were sent to the ghetto--a small area in the commercial district bordered by a river on one side and surrounded by high barbed wire. 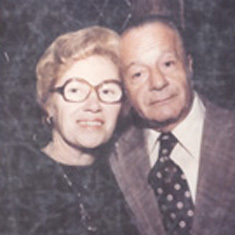 My grandmother and grandfather were both "lucky" that their family businesses had been located in the ghetto, so each had a place to call their own--for my grandmother, one room shared by sixteen people sleeping on straw mattresses, and for my grandfather, a room where he lived with his father and three brothers. My grandmother was a strong woman and was of use to the Nazis digging up potatoes in frozen fields, cleaning the Germans' homes, and carrying human waste out of the ghetto. They took her out to work every day from early in the morning until late at night and, a few times, put a gun against her head to kill her but she escaped. The Nazis rewarded a full day's work with a cup of watery soup and, occasionally, a piece of bread. My grandfather was able to bring in a little bread by caring for the Germans' horses and by working as a translator (he spoke seven languages). My grandfather was lonely. He had lost his wife and daughter. His mother had died, and his one sister had moved to Palestine. So he regularly visited my grandmother's family. Though my grandmother had many suitors closer to her age, her heart only danced for him. Her father would say to her, "Roza, why not find someone closer to your age?" My grandmother would answer, "What's the difference? We won't survive anyway." In September of 1942, the Germans staged their first of three aktions, or systematic killing sprees, in the ghetto. My grandfather, grandmother, and her younger brother, Reuven, were hiding in an attic at the time. Throughout the aktion, my grandfather cried, saying he knew the Nazis must have killed his father and brothers. In an effort to comfort him, my grandmother risked her life, running to his room to find his family. My grandfather was correct. They were all dead. During this fist aktion, the Nazis also killed my grandmother's twenty-five-year-old brother, Bentzi, and her twenty-two-year-old sister, Ruchel. With the second aktion, in early 1943, my grandmother's oldest brother, Moishe, was shot and killed, leaving behind his wife, Yente, and their baby, Esther. In December of 1943, the Germans decided that all of the Jews must die so their city would be Judenrein, free of Jewish presence. With great foresight, my grandmother's father had created a living grave in the ghetto and planned numerous hiding places outside the ghetto by paying off old work associates. Unfortunately, his foresight did not save his own life. He was killed during Judenrein as he prayed with a group of men in a hidden, makeshift synagogue along with his fourteen-year-old son Herschel. When the Germans came to my grandmother's family's room to search it, they shot her sister-in-law but threw a straw mattress over my grandmother and did not see her. At this point, she stealthily moved toward the living grave but, on the way, found her eighteen-month-old niece, Esther, in the corner of a shack. Her sister-in-law had left her there, hoping a Polish person would pick her up. If Esther did not move, she would soon be found and killed, so my grandmother took her to hide. The entrance to the hiding place was made to look like a septic tank. When my grandmother tried to enter, there were numerous people already inside who did not want to let her in because they said Esther would get them all killed with her crying. My grandmother said, "If you do not let me in, we will all get killed," but she promised to leave come morning. Her ten-year-old brother, Reuven, and three-year-old cousin, Chaike, also made it to the hiding place. Her mother and eight-year-old brother, Peretz, were taken by the Germans, but Peretz pulled his mother into a shoemaker's shack where they could hide until they could escape. The next day, my grandmother took Esther, Chaike, and Reuven to a non-Jewish woman who had worked for her father. She let them stay in the cellar, sitting on mounds of potatoes. Her mother and Peretz found them there. The next night they left for another hiding place about six or seven miles away. My great-grandfather had prepared a living grave on a Christian man's property. Through streams of tears, my grandmother convinced the man to let them in. She promised she would take one person a night to the next hiding place, another six miles away, until they were all gone. The first night, my grandmother went by herself to make sure the next man, in Uzefin, would let them in. When she got there, she gave him everything she possessed and he let her in, allowing her to lie on his bread oven to warm her frostbitten body. Over a period of six nights, my grandmother went back and forth, taking one person at a time in the snow to the next hiding place. My grandfather, who recalled my grandmother's hiding plans, had escaped the ghetto as well and found his surrogate family in their hiding place a few days later. They spent months living under the ground in the barn beneath the horses and cows. They had to use a bucket to relieve themselves. At night, they would open the entrance to get a little bit of oxygen. Once spring came, they used a small pipe to get air in the hole. They lived there for about a year, until the Germans and Poles (today Ukrainians in that region) began fighting and burned down the barn and the house of the man who kept them. They wandered in the forest where they slept on the ground and subsisted on raw potatoes. Then my grandmother and grandfather were separated again. My grandfather joined the partisans to fight against the Germans. My grandmother was the leader of the family, guiding her two little brothers, small cousin, niece, and mother through the forest. They reached the Russians near the end of 1944 in a town called Rogisht where they remained for a few months. My grandmother's skin was rotting from all she had been through. A pharmacist took pity on her and made a special cream. He also asked to marry her, but my grandmother was waiting to know if my grandfather was alive or dead. There were other offers as well, but she told them the same thing--she must wait to know about my grandfather. Finally, she heard from a few people who passed though Rogisht that they had seen my grandfather alive. The news also reached my grandfather that my grandmother was in Rogisht. He left the Polish partisans to find her, which gave him the new dilemma of becoming a deserter whom the Polish would want to capture and kill. He was elated to find my grandmother and her family. However, since he was a deserter, he was forced to go into hiding until things calmed down. After a month or two, they traveled back to their hometown of Ludmir, now occupied by the Russians. The Poles who had moved into my grandmother's house moved out and my grandmother and her family, including my grandfather, moved in. My grandmother and grandfather married in January of 1945. Of the twenty thousand Jewish people who had lived in Ludmir in 1939, fewer than one hundred survived. That meant nearly ten percent of the survivors--the seven of them--were from my grandmother's family. They did not stay in Ludmir long, however. The place that had once been their bustling, lovely home was now empty to them. In July of 1945, they left everything and traveled to Berlin, hidden in the double walls of a Russian man's truck. In Germany, they lived in one room of a military camp in Eschwege by Kassel outside of Berlin, where they worked and waited for an opportunity to leave Germany. In 1946, my grandmother gave birth to a baby girl, Eva. In 1949, my grandmother, grandfather, and three-year-old Eva came to the United States sponsored by the Hebrew Immigration Aid Society, which placed them in Jacksonville, Florida. Living in a foreign land where they did not speak English and had no money, family, or friends was hard, but it was still a welcome relief for the years of hardship they had suffered. With the same bravery, fortitude, and providence that helped them live through the war, my grandparents built a life for themselves and their family. They had two more daughters, my mother Anita and my aunt Susie. From this there are seven children and five great-grandchildren. I feel so lucky to still have my amazing grandmother by my side to teach my children and me at least a small part of the wisdom that she has learned through her extraordinarily difficult and courageous life. I feel it is my duty to make sure my children and grandchildren know her story as well as I do.